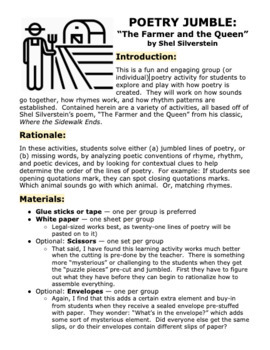 This is a fun and engaging group (or individual) poetry activity for students to explore and play with how poetry is created. They will work on how sounds go together, how rhymes work, and how rhythm patterns are established. 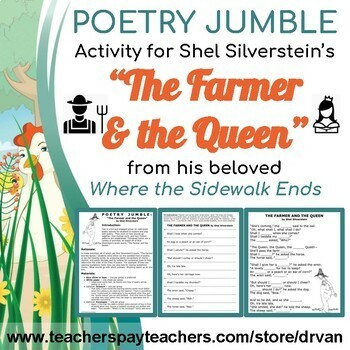 Contained herein are a variety of activities, all based off of Shel Silverstein’s poem, “The Farmer and the Queen” from his classic, Where the Sidewalk Ends. 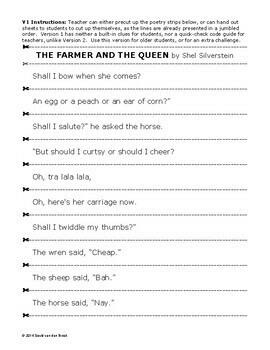 In these activities, students solve either (a) jumbled lines of poetry, or (b) missing words, by analyzing poetic conventions of rhyme, rhythm, and poetic devices, and by looking for contextual clues to help determine the order of the lines of poetry. For example: If students see opening quotations mark, they can spot closing quotations marks. Which animal sounds go with which animal. Or, matching rhymes.